This little handbook is only 3.75" x 5.75" and less than 3/4 inch thick, yet it contains over 300 pages. Printed on inexpensive paper with a beautiful full color cover, this book contains every prayer, meditation, novena, and Mass for the Holy souls that you could imagine. 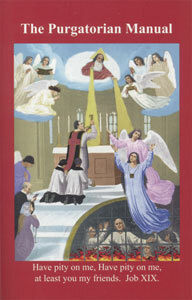 It is a treasure for those who love the Holy Souls and is priced to sell in quantity.